In chemistry and physics, Dalton's law (also called Dalton's law of partial pressures) states that in a mixture of non-reacting gases, the total pressure exerted is equal to the sum of the partial pressures of the individual gases. 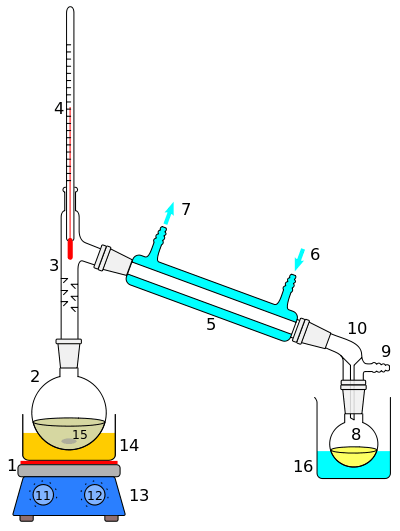 This empirical law was observed by John Dalton in 1801 and is related to the ideal gas laws. where yi is the mole fraction of the ith component in the total mixture of n components . Dalton's law is not strictly followed by real gases, with deviations being considerably large at high pressures. Under such conditions the volume occupied by the molecules can become significant compared to the free space between them. In particular, the short average distances between molecules raises the intensity of intermolecular forces between gas molecules enough to substantially change the pressure exerted by them. Neither of those effects are considered by the ideal gas model. 1 2 Silberberg, Martin S. (2009). Chemistry: the molecular nature of matter and change (5th ed.). Boston: McGraw-Hill. p. 206. ISBN 9780073048598.